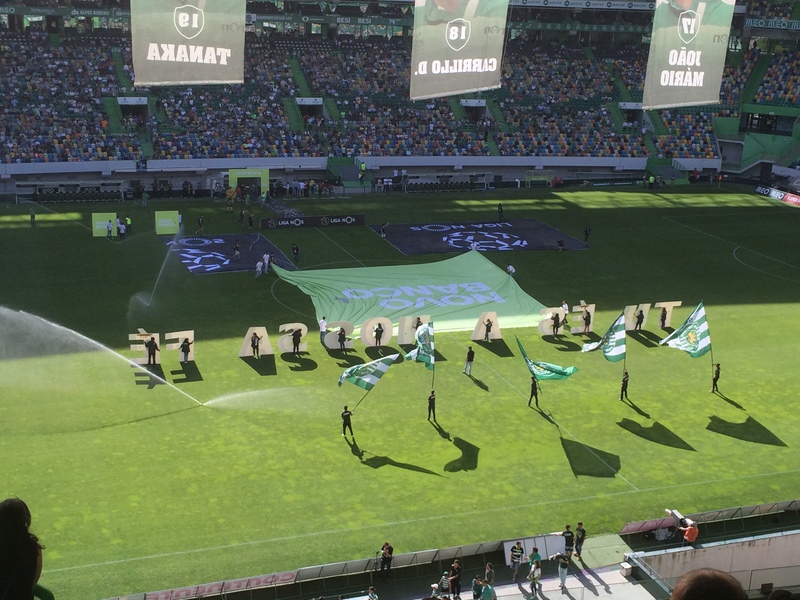 As well as my little bit on my stadium experience in Lisbon a couple of weeks ago, I thought I would get round, at last, to doing a small match report. Things started off rather poorly for the home side a fortnight ago. 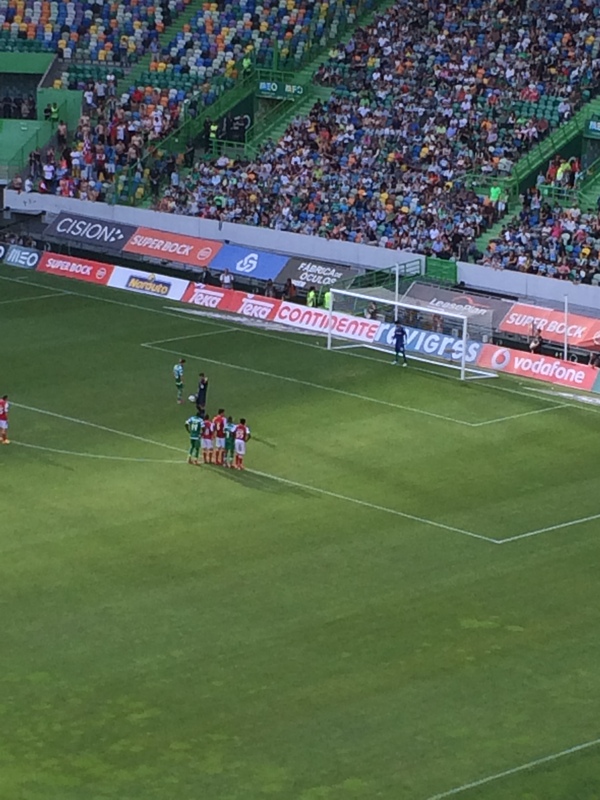 Tobias Figueiredo, the young Sporting centre-half, was booked for a rather stonewally foul in the Braga penalty area in the fifteenth minute of the match. Colombian Felipe Pardo ignored the utterly deafening whistles of the home supporters, and sent the 37 away fans a bit wild to give Braga the lead. As fellow lovers of the beautiful game may be aware, Nani was on loan at Sporting this season just finished. In the 24th minute, he was booked, and the Portuguese lady sitting next to me was not impressed with the circumstances. The Manchester United cut up the left wing and found himself faced with a determined-looking Braga defender. Nani succeeded in doing about 6 stepovers, lost the ball, fouled the man who stole it from him, and in doing so got booked. 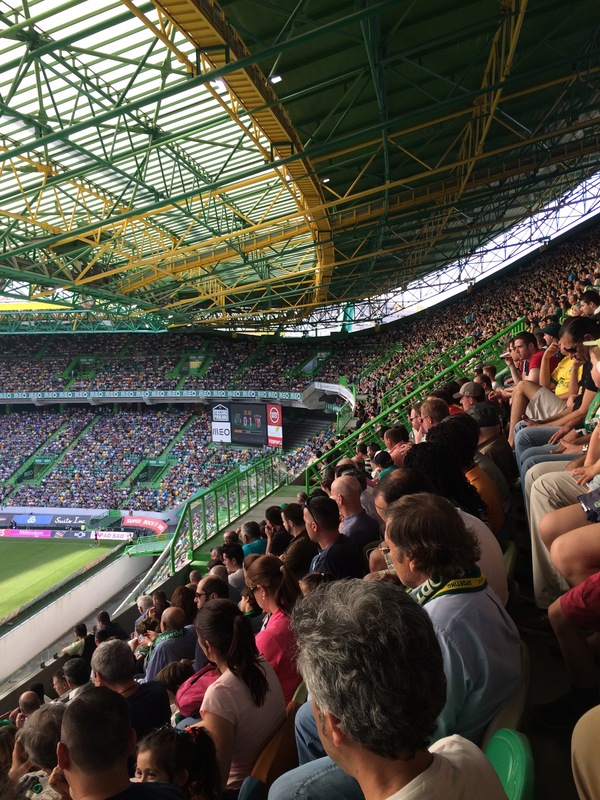 He was underwhelming as always, and in his last match at the Jose Alvalade before he went back to Manchester. 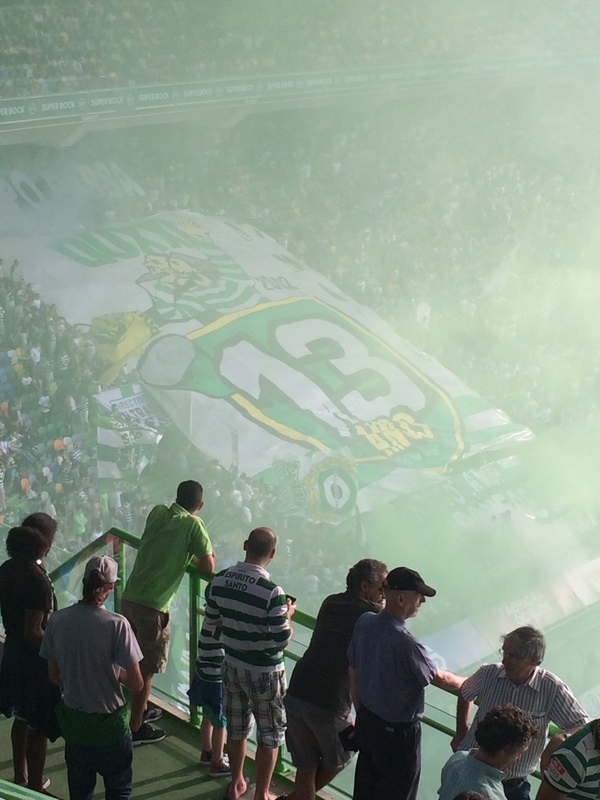 With half-time approaching and the green and white hooped Lisboans becoming a tad restless, Sporting drew level. A penalty was given, and to this day I have no idea why but presumably the referee spotted some kind of infringement. Regardless, Adrien Silva calmly stuck the ball home from 12 yards. Half time arrived with the score 1-1, and I have to say I was a little unimpressed with what was on show. Lots of losing possession, dodgy passes and heavy touches on show from both sides. The Ultras to my left were undoubtedly the highlight. I liked Joao Mario, the young winger, who had probably been the most enterprising Sporting player on show. 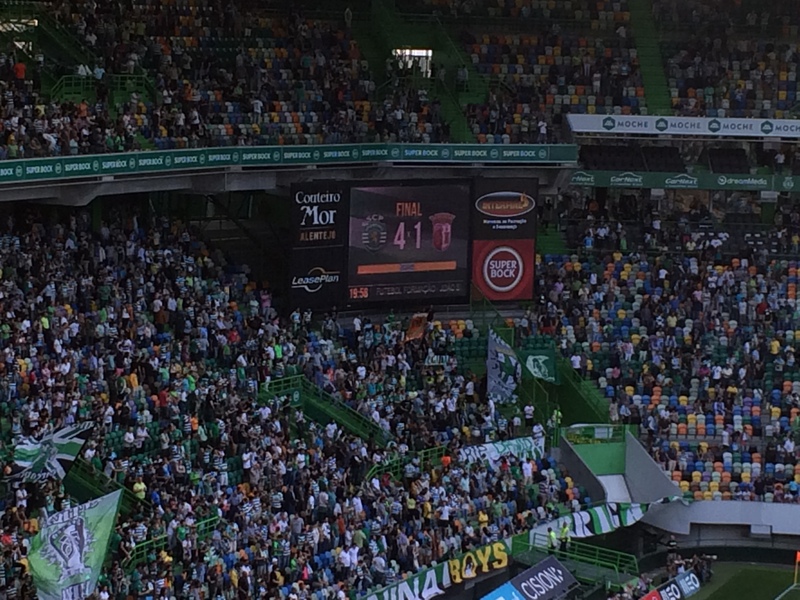 Seven minutes in the second half and the home fan were shouting “DOIS! UM!” at the announcer as Sporting took the lead. Braga failed to clear their lines at the first ball, and Tobias was there, having had a rather eventful game already, to stick the ball in and cheer up the home fans. “Golo” indeed. Twenty minutes later, 2-1 became 3-1 with the game’s first bit of real quality. 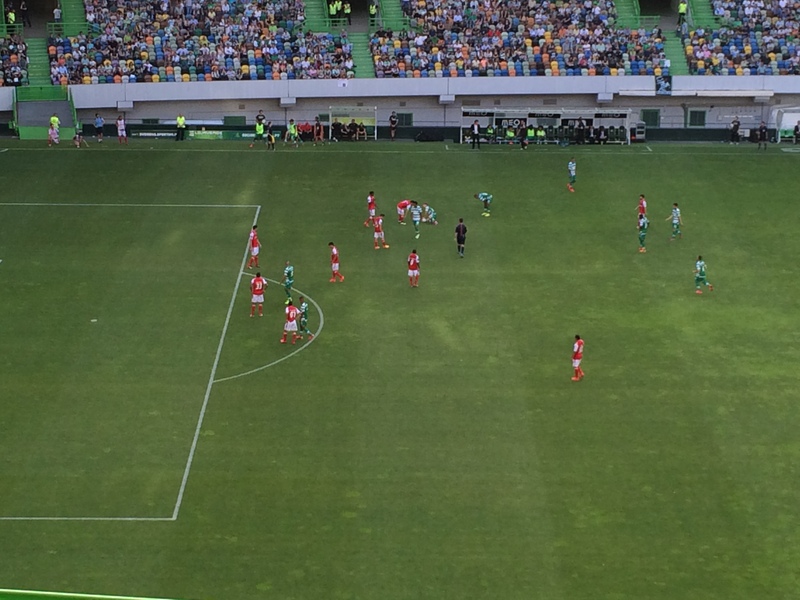 Adrien picked up the ball 25 yards out, and lashed it into the net past Matheus in the Braga goal. With that, the match was largely over. It wasn’t too late for substitute Islam Slimani, a player I was rather keen to see, to add a bit of icing to Sporting’s cake. 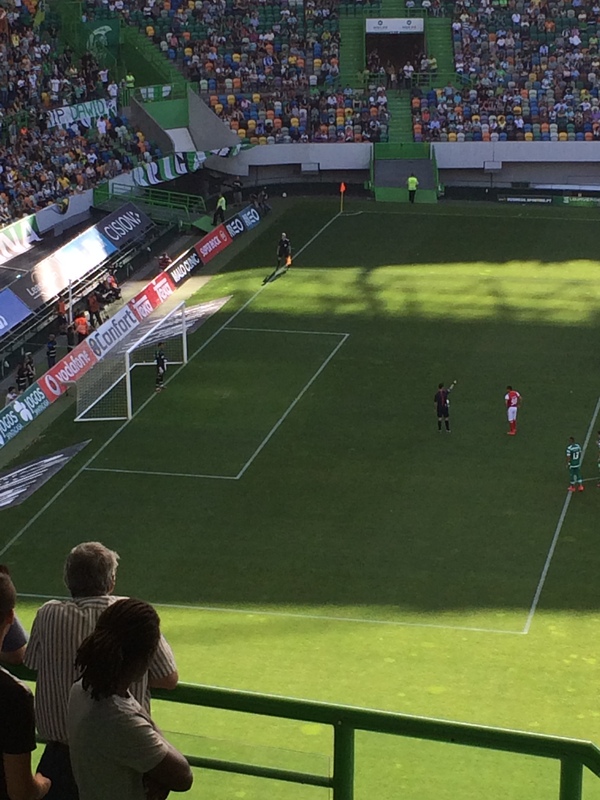 A good ball in from the Sporting right found the Algerian international completely unmarked on the edge of the Braga six-yard area, and having done nothing since he came on at half time, he side-footed one home. With the final whistle, it was a fairly resounding win for the home side. I liked the look of Joao Mario, as well as Carvalho and Adrien for Sporting. Nani received an outstanding ovation from the home support in his last game of his loan spell at the Alvalade, but he was largely his incredibly frustrating self. I did also get to see Alan play for Braga, which I enjoyed mainly as he’s a man who has decided to call himself just “Alan”. As mentioned, I wasn’t overly impressed with the quality of football on show, though it did improve a little in the second half. This result also made one thing clear – after Atletico’s 4-0 win the last time we went to a game abroad, Clare and I are pretty good luck for foreign football teams.
. This post focuses on the stadium experience. Having gone to Atletico expecting carnage and instead getting a chap smoking a cigar and playing with his iPad, I had a slight reverse experience in Lisbon. 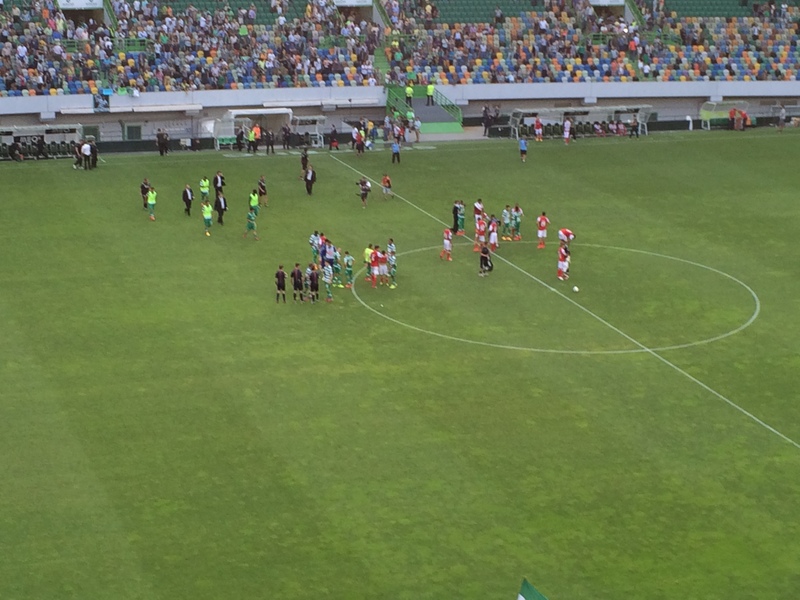 I wasn’t expecting things to be too mad for an end of season match in a season which had been decent for Sporting, but not spectacular (safely in third). Having bought some pre-match scran and water from the Lidl handily placed under the stand we would sit in, it was then promptly confiscated on the way in. Our entrance (B) also seemed to be the entrance for the Ultras which saw us come into contact with a couple of interesting characters. The confiscation rule didn’t seem to, thankfully, extend to the Smints and the jumbo pack of cashews in Clare’s handbag. Once we were inside the stadium and took our seats, things did start to calm down. With that slight mellowing of the mood, we were able to appreciate our surroundings a little. 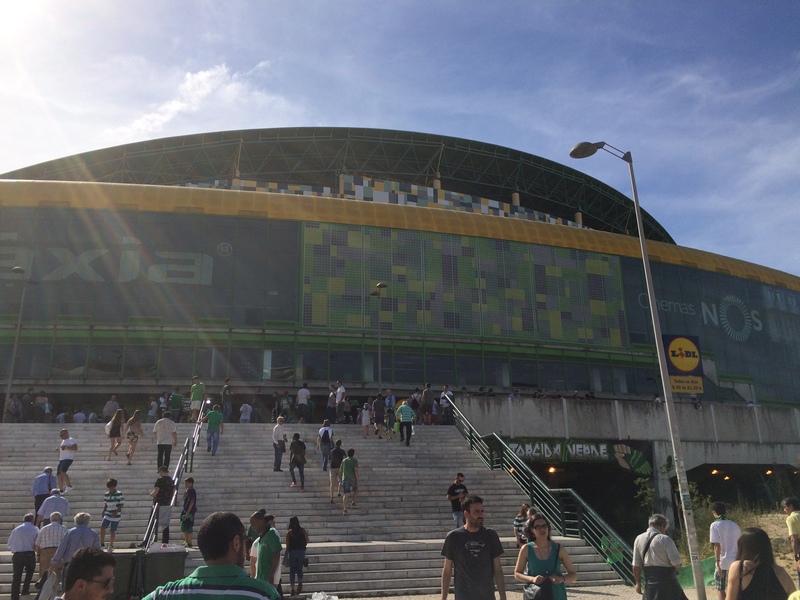 The Alvalade was completed in 2003, built as a replacement stadium for Sporting, and also used as a host stadium at Euro 2004. 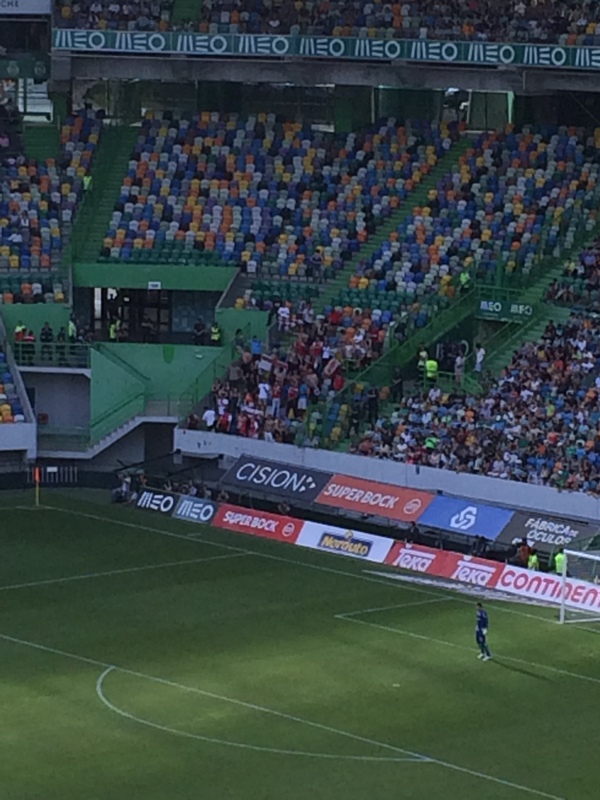 The stadium, like Uniaio Leiria’s built for the same tournament, has multicoloured seats so that the ground appears to be more full than it actually is. The seats are also padded, which was a merciful break for us having had a very early flight to Lisbon from Edinburgh that morning. From the second we sat down, it was clear that the Ultras would be taking up residence in the end to the left of us. As they did at the Atletico match, and I’m sure in most other stadiums in Europe, the Ultras made the bulk of the noise in the stadium, the rest of the crowd occasionally joining in.as they felt appropriate. I also liked the fact that this lot of (very well-organised) Ultras seemed to have conductor chaps at the front of the stand telling them what to do. At certain points of the evening, watching the Ultras was far more entertaining than watching the football. 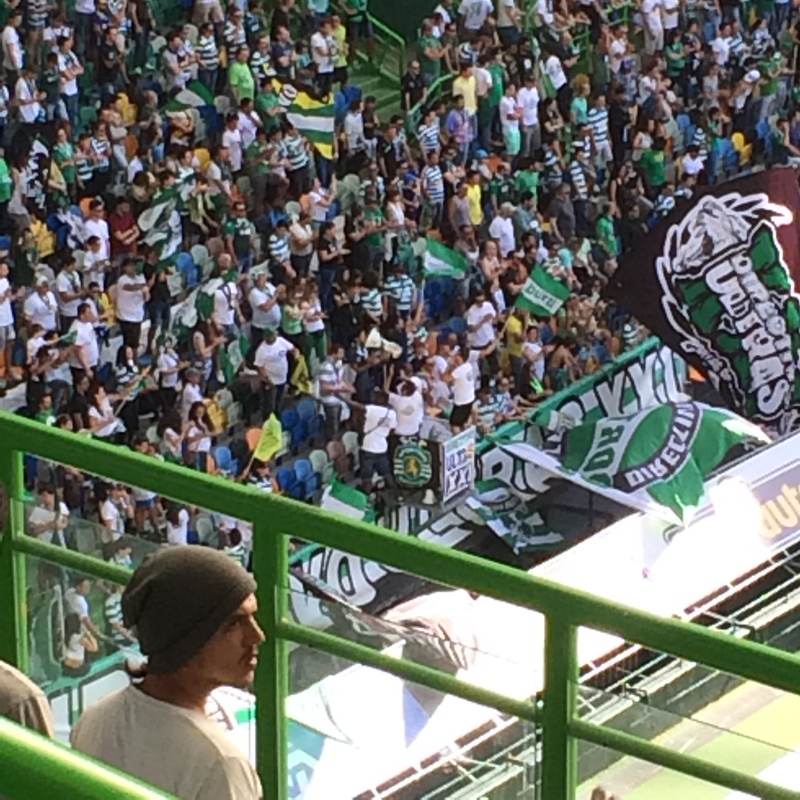 We did also manage to spot some away supporters at the Jose Alvalade – we hadn’t seen any obvious groups of travelling fans at the Calderon. Clearly the tradition in the UK for away supporters is not reflected in wider European football, however a very small gaggle of Braga supporters were doing their best to noise up the home support, even though that largely failed. The other thing I really noticed was the whistling. When Braga were awarded a stonewall penalty fifteen minutes into the game, the whistling of the home fans in the build-up to the penalty was absolutely deafening. I was impressed that Braga’s Felipe Pardo managed to ignore it a lot better than I did, and send the keeper the wrong way. In all, it was great to take in football in a different country once again, and appreciate the differences and similarities in how the game is enjoyed abroad. The Portuguese fans are clearly, as you would expect, a knowledgable and passionate bunch. They whistled deafeningly, they cheered, they set off firecrackers and my own personal bete noir, the smoke bomb, they shouted “Golo” when Sporting scored, they even sang a bizarre song set to the tune of “My Way” about their side. It is those similarities I love though. Even though there is an obvious language barrier in these situations (my attempts at Portuguese were pitiful), people nonetheless have a good idea what you are shouting and vice versa. Every time Nani gave the ball away or did 14 stepovers in a ridiculous position, the woman sitting next to me was presumably shouting the Portugese equivalent of my uncultured “what are you daein Nani” (there might have been some expletives in there). Football is a simple game, and that’s why people across the world, despite its ever-increasing corporate cynicism, love it. A match report will follow, probably tomorrow. I’m here tonight – more to follow when I get home.